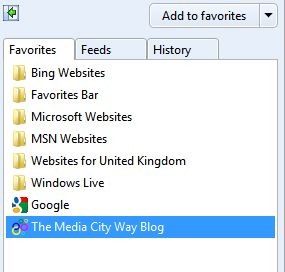 The Media City Way Blog: What is, and Why a Favicon? What is, and Why a Favicon? A favicon is a small icon which is a visual link or a connection to your webpage or website etc. It is a small image, and shown in your browser bar or your bookmark area. Because it is so small it is best to keep it very simple, maybe use your initial or a simple logo, but what it actually does is give your site a brand and get you a more prominent place in the users bookmark section and allow you to be located easier when you have multiple web pages open. To add one is very simple, just add the following code between your head tags to link to your .ico image file. For any help with creating your .ico file contact us at Mediacityway.com anytime.